An impressive Recognition of the new Theory of Prof. George Vithoulkas "The Continuum of a Unified Theory of Diseases”. Our Research Team, Dr. Seema Mahesh, Prof. Vitalie Vacaras and Prof. George Vithoulkas have presented a poster which has been awarded as the Best Poster (Certificate of Excellence) at the Congress "MOVEMENT AND COGNITION INTERNATIONAL CONFERENCE – Neurological Conference", which was held at Harvard Medical School. "The idea of the "Continuum of a Unified Theory of diseases” by Prof. Vithoulkas has been evidenced through inspection of 100 cases with multiple sclerosis. 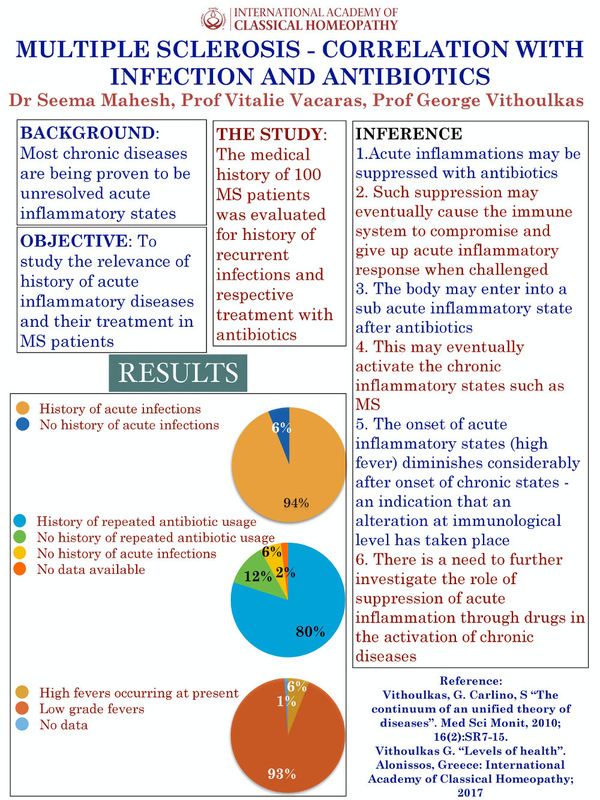 The percentage of patients with pre-history of frequent acute inflammatory episodes treated with abuse of antibiotics are showing a significant reduction of acute inflammatory conditions after the onset of serious MS states. This is an evidence that the immune system has been compromised and allowed on the one hand the manifestation of a subacute chronic condition like the MS and on the other hand minimised the manifestation of acute diseases.